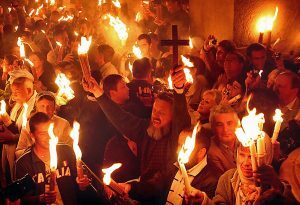 “The Holy Fire” is believed by Orthodox Christians to be an annual miracle performed by God on the eve of Easter, the celebration of Jesus Christ’s resurrection — and is totally unknown to most Western Christians. And it’s condemned as a “fraud” by many scientists and others who believe that if they can’t see it, touch it or spit on it, it doesn’t exist. I’ll give you my opinions about it later in this column. But first, let’s take a look at it, throughout most of the history of Christianity, right up to this Saturday, when it will occur yet again. Each year, on the Saturday just before Orthodox Easter, or “Pascha” (which falls on the same Sunday as the Western Easter this year, although it usually doesn’t), thousands of Orthodox faithful from many nations flock to Jerusalem in Palestine, to the Church of the Holy Sepulchre, which was built by early Christians many centuries ago, over the spot where many Christians believe Jesus Christ was buried after His crucifixion, and where three days later, He rose from the dead. They come to witness, to participate in, and to rejoice over, the Holy Fire. At about 11 a.m. on Holy Saturday — this year, this coming Saturday — the Greek Orthodox Patriarch of Jerusalem arrives at the Sepulchre, escorted by his attendants, clad in his usual clerical robes. He removes the outermost robe, and representatives of the Israeli government formally search him to make sure that he is not carrying any lighters, matches, or anything else that could be used to light a fire. They also search the inside of the grotto to make sure nothing flammable has been hidden in there. At noon, the patriarch, carrying a large bundle of unlit candles in each hand, enters the grotto, and others close the door behind him. The crowd, standing in almost pure darkness in the Sepulchre, murmurs loudly, milling around slightly, their own unlit candles in hand, waiting for the great moment. And then, sometimes quickly, sometimes in a bit longer time, a light suddenly flashes up inside the grotto. Patriarchs have said later that it is like a sudden, vertical blue flame, from which tongues, so to speak, of fire emerge to light his candles. In a moment, the patriarch emerges, with all the candles he carries in each hand, now lit and flaming. The thousands of Orthodox believers gathered around the grotto erupt into roars of joy. Then those nearest the patriarch, begin lighting their candles from those he holds, which were ignited directly by the Holy Fire. The fire is quickly passed from one believer’s candle, to another’s, and another’s, until the whole area around the tomb is filled with the joyful light. The “miracle,” as it’s believed to be by the Orthodox, has been filmed and, in later years, videoed numerous times. It is shown live on TV in a number of predominantly Orthodox countries each year. 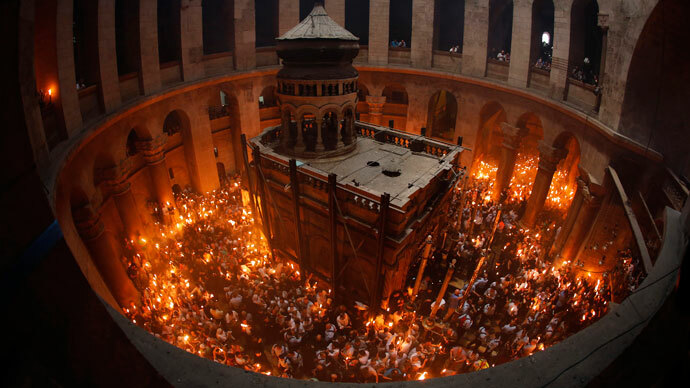 And the Holy Fire, burning on the hundreds of candles, is often transported to those countries via aircraft as part of the Pascha/Easter celebration. And when did this “miracle” begin to occur in Christian history? Well, the Greek historian Eusebius, writing in 328 A.D., tells of reports from 162 A.D. that church wardens were preparing to put oil in a number of lamps as part of the celebration of Christ’s resurrection. Suddenly they discovered that all the oil they had on hand, had disappeared! Bishop Narcissus of Jerusalem, who was in charge of the church in Jerusalem at that time, ordered the wardens to pour water into the lamps, and light them. When they did, all the lamps ignited, and burned as if they contained oil as usual. A Christian woman named Egeria, who traveled on a pilgrimage from Spain to Jerusalem in the year 385 A.D., wrote later of witnessing a ceremony there where a flame emerged from the small chapel surrounding Jesus Christ’s tomb, engulfing the entire church with an infinite light. So, the Holy Fire dates back many centuries. And, of course, cynics, scientists, disgruntled ex-Orthodox Christians, and others have tried periodically to “debunk” the story of what Orthodox faithful believe is a miracle. “Oh, white phosphorous has been known of for many centuries, and it doesn’t burn one until its flames have been going for 20 minutes or so, so of course that proves that it’s all a fake,” they have said. No explanation of how the “white phosphorous” is put into the grotto, unbeknownst to anyone (remember, the Israeli officials who search it are not Christians). Or how it is set alight by the patriarch who has been searched for lighter and/or matches beforehand. And do they actually think that with only 20 minutes or so of “pain-free fire,” there would not have been accidents repeatedly through the centuries, with people being burned because “their time had run out”? And for that matter, in what way would it benefit these cynics, these scientists and would-be debunkers, if it WERE possible for them to prove conclusively that the Holy Fire is just a fraud, a sleight-of-hand magician’s trick, of some sort? The people who never believed in it to start with, would nod their heads and say, “See? I told you so!” And the Orthodox believers, or a huge majority of them, would continue to believe. You see, in this world, there are things that can be explained, logically. And there are things that can be disproved, logically. But, there are also things that cannot be proved, OR disproved. You either believe in them, or you scoff at them. The choice moves away from your mind, or whether you can see it, touch it or spit on it; and moves to mysticism — your spirit. Beautiful story. Thank you for sharing it at this most appropriate time of year. Looks as if you did your ‘homework’, as usual. Good job!